For Windows Developers who need to create WMV 9 profile within their business application. Create WMV Profile in run time. Custom define video codec, video bit rate, buffer window, video width/height, Key Frame, VBR Mode,Quality. Custom define audio codec, audio format, buffer window. Custom define script bit rate,buffer window. Custom define language in profile. You can create video profile ,audio, script profile only. Object base design, easy to use. 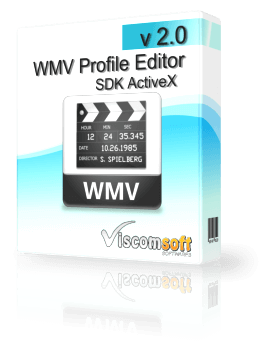 Created Profile use in VideoCap, VideoEdit, VideoEdit Pro ActiveX Contros or third party application that support wmv/wma files. Compatible with any programming language that supports ActiveX (Access, Visual C , Visual Basic , Visual Foxpro, Delphi, .Net, etc). added FindVideoCodec, FindAudioCodec, FindAudioFormat, FindLanguage, GetTempPath, DeleteTempFile methods.